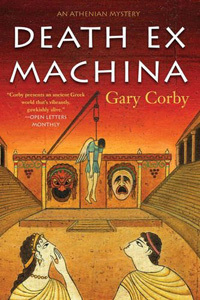 Death Ex Machina by Gary Corby: Synopsis and Online Purchase Options. Synopsis (from the publisher): It's the time of the Great Dionysia, the largest arts festival of the ancient world, held each year in honor of Dionysos, the god of wine. But there's a problem: A ghost is haunting Athens's grand theater. Nicolaos and his clever partner in sleuthing (and now in matrimony), the priestess Diotima, are hired to rid the theater of the ghost so that the festival can begin. With the help of Theokritos, the High Priest of Dionysos, they exorcise the ghost publicly, while secretly suspecting that a human saboteur is the actual culprit. Their efforts to protect the theater fall short when one of the actors is found hanged from the machine used to carry actors through the air when they play the part of gods. It's quite a theatrical murder. As Nico and Diotima dig into the actor's past, they discover all was not as it seemed. There are enough suspects to fill a theater. As the festival approaches and pressure mounts on all sides, can they hunt down the killer in time? Or will they simply have to hope for a deus ex machina?